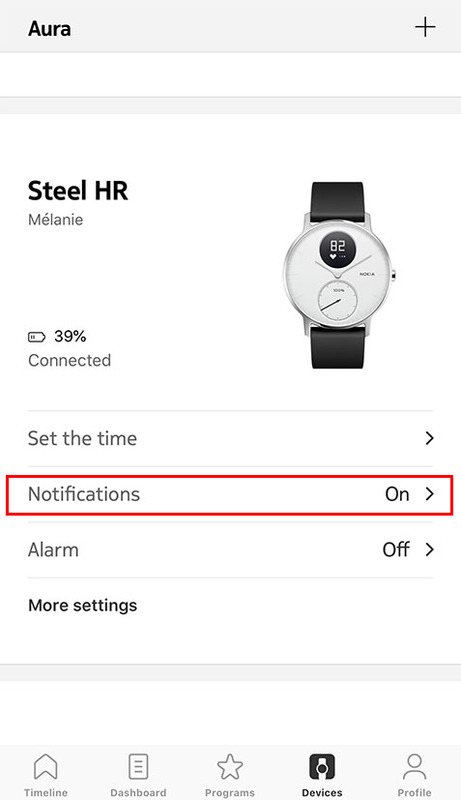 If you want to get notified on your Steel HR / Steel HR Sport when you have an incoming call, a text message, or when you receive an email and a calendar event, you can enable the Notifications option. Tap Enable notifications and Applications, then select the notifications you want to enable. Tap the back button in the top left corner to confirm. You can activate third-party apps notifications on your Steel HR / Steel HR Sport. To do so, go the Devices > Steel HR > Notifications. Select Enable Notifications and Applications. Then, select the apps from which you want to receive notifications on your Steel HR. Make sure that the Health Mate app is open in background on your phone and that notifications are enabled on your phone settings. Note that third-party apps notifications are only available with firmware 4911 or higher (for Steel HR) / firmware 5301 or higher (for Steel HR Sport). Click here for more information. You need to have the Health Mate app open in background and receive one notification before being able to receive all notifications from some third-party apps on your Steel HR. 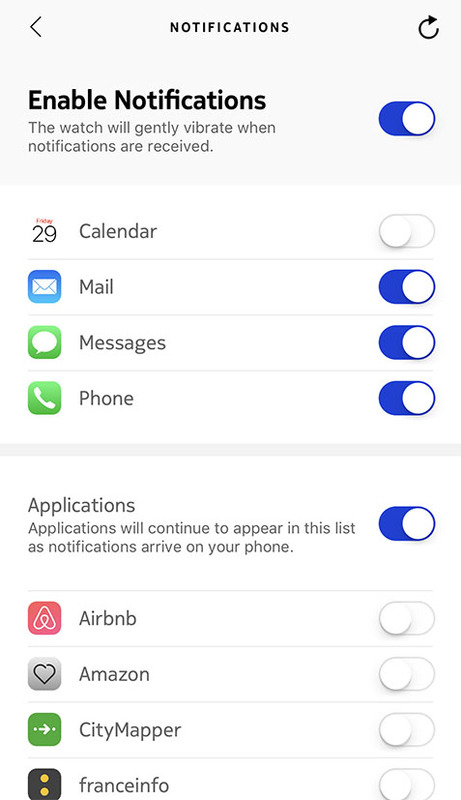 Make sure that notifications are activated on your phone: « Allow Notifications » and « Show in History » (iOS 11 or older versions) or « Notification Center » (starting iOS 12) should be enabled to receive notifications on your watch. Check the list of third-party apps available in the Health Mate app, and activate the app from which you want to receive notifications. Tap Notification access in the search bar and select it. Under 'Special app access', tap Notification access again. Enable Notification access for Health Mate. Make sure that "Do not disturb" and/or "silent" mode are not activated on your phone. If they are activated, you may not be able to receive notifications. You can choose to deactivate Do not disturb directly on your Steel HR / Steel HR Sport. To do so, press and release the button to go through the screens until the Do not disturb screen is displayed. Press the button of your Steel HR / Steel HR Sport for about a second until « OFF » is displayed on the screen. The notifications have been deactivated. If you deactivated the notifications screen on your Steel HR / Steel HR Sport, you won’t receive notifications anymore on your watch. However, all third-party apps will still be activated in the Health Mate app. If you want to reactivate notifications, press the button of your Steel HR / Steel HR Sport until « ON » is displayed on the screen. Health Mate - Android App - I'm having issues with the notifications. What should I do?